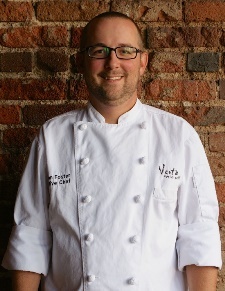 Brandon Foster comes to Project Angel Heart from Vesta Dipping Grill, where he worked his way up from line cook to executive chef. Get to know Brandon in our Q&A. Q: When did you first decide you wanted to start cooking? Why? A: Probably at a pretty early age, I was pretty young. I always really enjoyed being in the kitchen cooking with my mom. My aunt used to have a restaurant in Denver called Cucina Leone, and in ninth grade I got to spend a day with her in the kitchen making pizza and doing everything with her and it was really, really fun. So I kind of had a little bit of a draw to it ever since. Q: How did you first get into the culinary world? A: I started at a Best Western hotel in Frisco. I moved to Colorado to be kind of a ski bum not really knowing that I was going to start my cooking career at the same time. I started as a dishwasher, then the chef offered to teach me how to cook, and that was it. I spent five years there before I moved to Denver. Q: What inspired you to apply for the job at Project Angel Heart? A: I’ve always known a lot about the organization and had a great deal of respect and admiration for what goes on here, and I’ve really been after a job that is more fulfilling for the greater good. And Jon [Emanuel, prior executive chef at Project Angel Heart] is a huge inspiration for me, too. He‘s been a great friend and mentor. Q: What are you most excited for in your new position? A: Doing something every day that has so much more of a direct impact on peoples’ lives. Q: What will take the most getting used to in your new position? A: Being home at night and on the weekends. I’m looking forward to that. Q: What is your happiest food-related memory? A: About a year before my grandfather passed away, I got to cook for him at Vesta on his 80th birthday. At the end he gave me a big hug and told me he was super proud of me. That’s about as good as it could get. A: I have two daughters, Amelia, who is eight, and Ella, who is four, and my lovely wife, Larissa. They are the loves of my life. Q: Which of your meals are your daughters’ favorites? A: I would say Amelia likes anything breakfast and anything with bacon or sausage or salami. Ella will eat just about anything, but the one thing I think is funny is when I make chili she requests red chili and not green because the green is too spicy. Q: What is your favorite kitchen tool/gadget? A: Spoons. I have a bunch of medium sized spoons that can be used for anything- cooking, plating, holding the other side of the pan. I have a spoon collection, a couple that are family heirlooms. Q: What is your least favorite thing to eat? Q: What is your favorite veggie? Favorite fruit? A: Ramps and Colorado peaches. I like stuff that you can’t get all year long; part of what makes them so great is that you only have this very small window where you try to eat as many as you can. Q: So do you shop at farmers markets? A: Yes. I’m excited for the Union Station farmers market to start this summer. Alex Seidel [chef at Mercantile Dining & Provisions, Fruition] and some of the other vendors at Union Station worked with the Boulder Farmers Market to set it up, and they take an extra level of accountability in making sure that people are being honest with what they’re selling. It also gives small farmers a chance to showcase their stuff. They did a trial run last year and it was great. Q: If the world were ending tomorrow, what would you eat for your last meal? A: A chili relleno burrito from El Taco de Mexico. This entry was posted in From the Kitchen, News by Project Angel Heart. Bookmark the permalink.